Create dazzling nail looks with the nails inc. 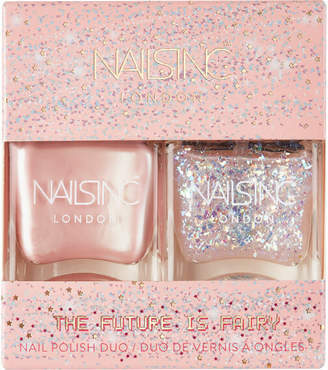 Trend Duo Future Is Fairy Nail Polish Duo . Formulated with a long wear system to help prolong your manicure, the nail varnishes glide effortlessly on, delivering iridescent pearl colour for an eye-catching finish. Wear alone or layer together to create customised looks. Equipped with a wide hugging brush for flawless application. 2 x Nail Polish (14ml) in ' Donâ€™t Give a Flutter ' ( soft pink with pearlescent shimmer ) and ' Fairy Freckles ' ( clear pink base with crushed iridescent jewels ).